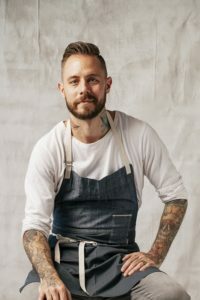 Derek Simcik spent his formative years experiencing foods from around the world having lived in Greece, Tunisia, Germany, France, Hong Kong, Japan and Austria all before the age of 20. Born in Athens, Greece to American parents, Derek has a great respect for local culture and their unique cuisine. The international influences of Chef Derek’s style continue in Seattle, a global hub which allows him to translate his eclectic childhood experiences into an edible story. Today, Derek takes advantage of the bounty of the Pacific Northwest at Thompson Seattle, where he will unveil his newest restaurant concept, Conversation, in May 2019. He previously opened Scout PNW in the same space, named one of “Seattle’s 10 best new restaurants of 2016” by the Seattle Times. In his role, Chef Derek also oversees all culinary direction for The Nest rooftop, hotel events, and regional culinary operations for affiliated properties in the Seattle area. Prior to joining Thompson Seattle, Derek spent 8.5 years at Kimpton Hotels and Restaurants opening two Washington, D.C. hotspots, Morrison House and Jackson 20, before taking the helm at Chicago’s Atwood in 2009. As Executive Chef of Atwood, Derek won wide acclaim in his four-plus years of service. In 2014, Derek opened Santa Barbara’s bohemian oasis, Outpost at The Goodland, in a dual role as the Executive Chef and General Manager. Derek is a creative chef with a business mindset, excelling at forecasting, budgets and running a profitable operation; he is also fluent in utilizing social media and technology to execute marketing strategies. In the kitchen, he strives for perfection and timeliness, and has a true passion for pushing the boundaries of culinary creativity.